Welcome to November! If it’s the beginning of the month we must be close to another edition of “Forza Monthly.” Our latest episode of our monthly magazine show all about the world of Forza is coming to you on Monday, November 5, beginning at 1 p.m. Pacific. We’ll have guests from all over the world of Forza, and we’ll be diving deep into the November update for Forza Motorsport 7, as well as giving you a sneak peek at Season 3 in Forza Horizon 4 with Playground Games, and a look back at the ForzaRC 2018 season with some special guests. It’s going to be a fantastic show so be sure you’re tuned in to our Mixer and Twitch channels to watch it live! 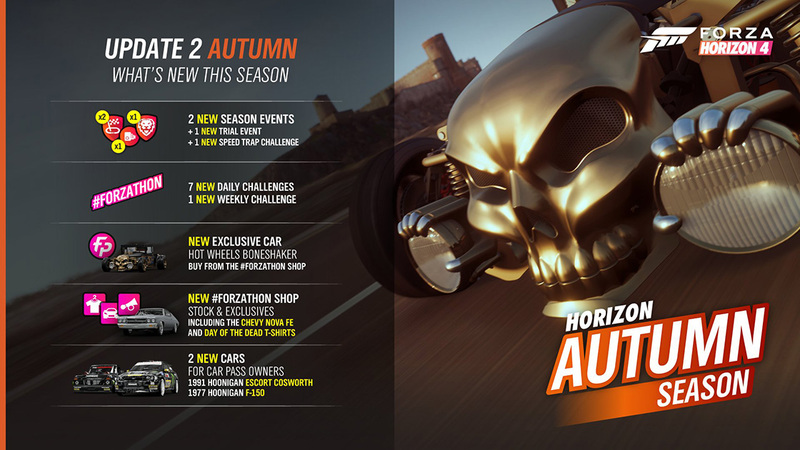 Today we’re welcoming Autumn back to Forza Horizon 4, looking at the Hot Wheels fun coming to both FH4 and Forza Motorsport 7, as well as an important change to our Forza Rewards Loyalty program that is tied to the upcoming removal of prize crates in Forza Motorsport 7. 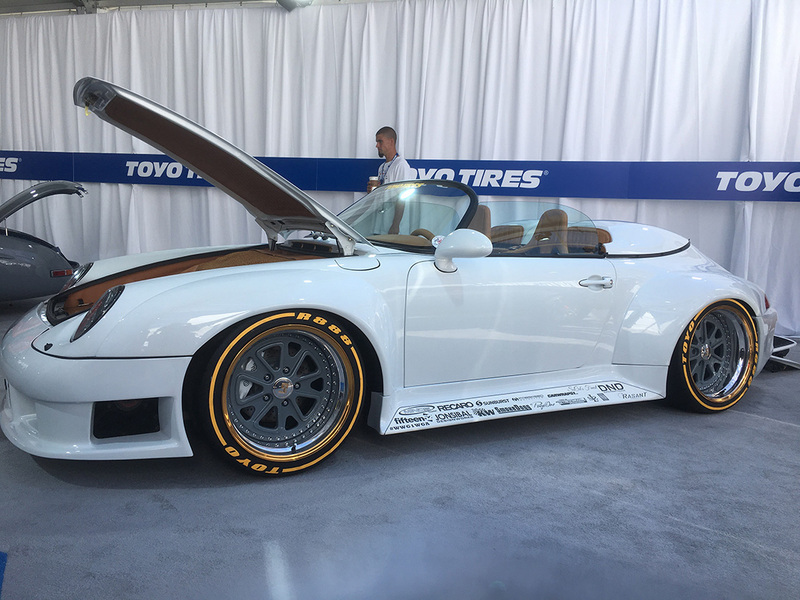 All that plus a look at SEMA 2018, and more so let’s dive in! 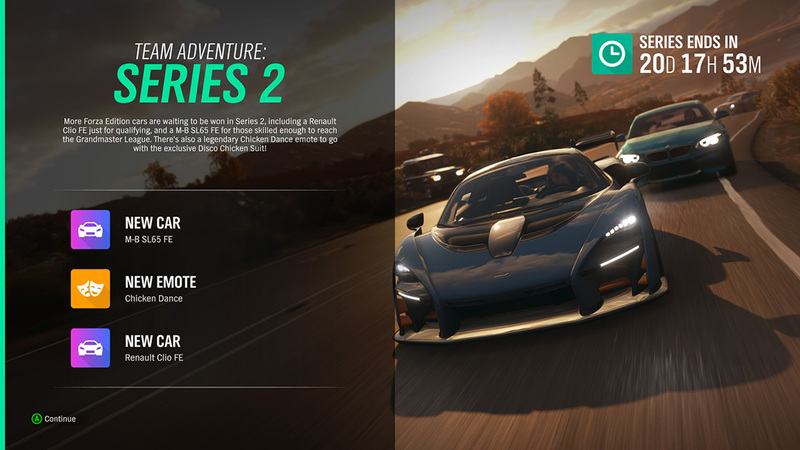 In addition to the above, Season 2 of Team Adventure is here, and there are some great Forza Edition cars available, including the Renault Clio Forza Edition for those who qualify and the Mercedes Benz SL65 Forza Edition, for players who are skilled enough to get to the GrandMaster League. And then there’s that Chicken Dance emote, the perfect accessory to – what else? – the chicken suit? 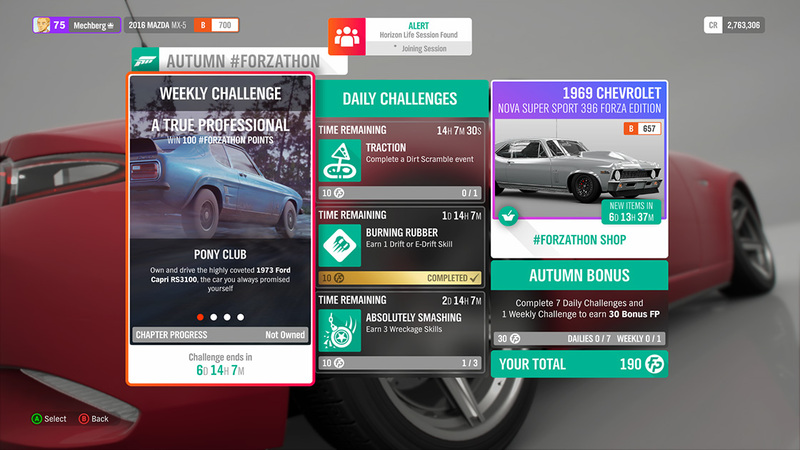 An important note for Forza Horizon 4 players: We will be wiping the club leaderboards for Forza Horizon 4 in the vey near future. This is the result of an investigation where we determined that numerous players took advantage of a glitch with the Goliath event (as well as other race events) to earn illegitimate XP and artificially raise their position on the Club Leaderboards. We have since corrected this issue and, to maintain the fairness in our Club Leaderboard rankings, we have decided to reset the leaderboard accordingly. 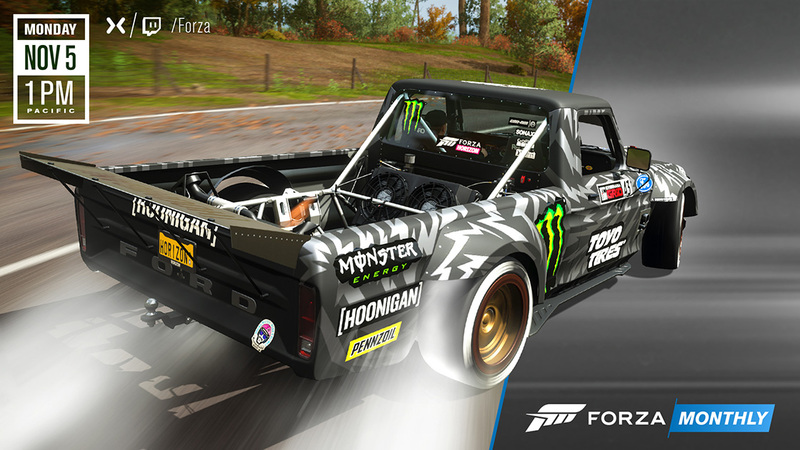 If playing Forza Horizon 4 as much as possible isn’t enough, you can now roll in Horizon gear IRL thanks to our Forza Shop on the Xbox Gear store. T-shirts, hats and sweaters are all available for purchase to keep you (or your favorite Forza fan) looking fresh. Check out the store now to see all the available gear. As always, all Tier rewards are cumulative. For example, a Tier 10 player would earn the three Tier 10 Mod cards (Grid Improvement, Payday, and Top Five), plus all of the cards in the lower Tiers. Note that these Mod rewards are only available to new Forza 7 players; those who have already received their Loyalty Rewards for Forza Motorsport 7 will not receive these additional Mod cards. 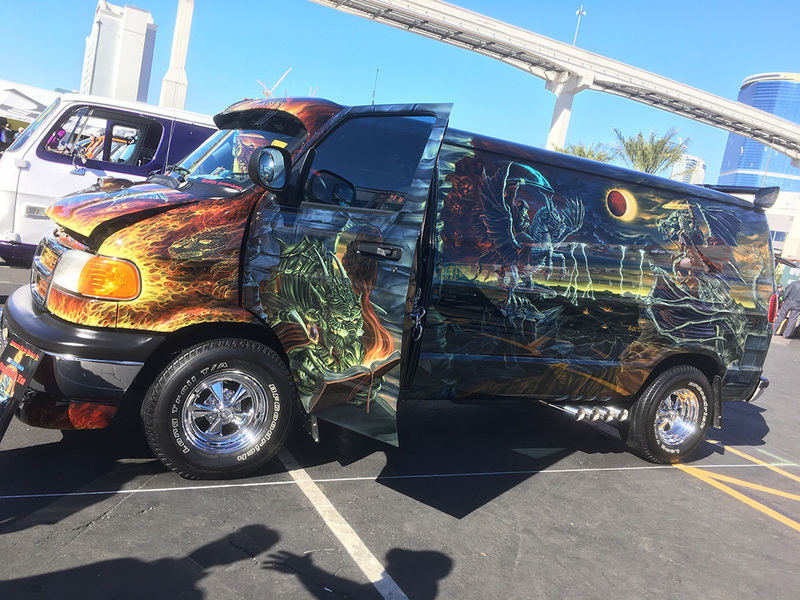 As you may know, the Specialty Equipment Market Association, more commonly known as SEMA, is one of the biggest car show/conventions in the world. I have been wanting to attend since I learned of it shortly after starting with Turn 10 in 2012. This year was my year, and boy did we pack in a heavy schedule of awesome. 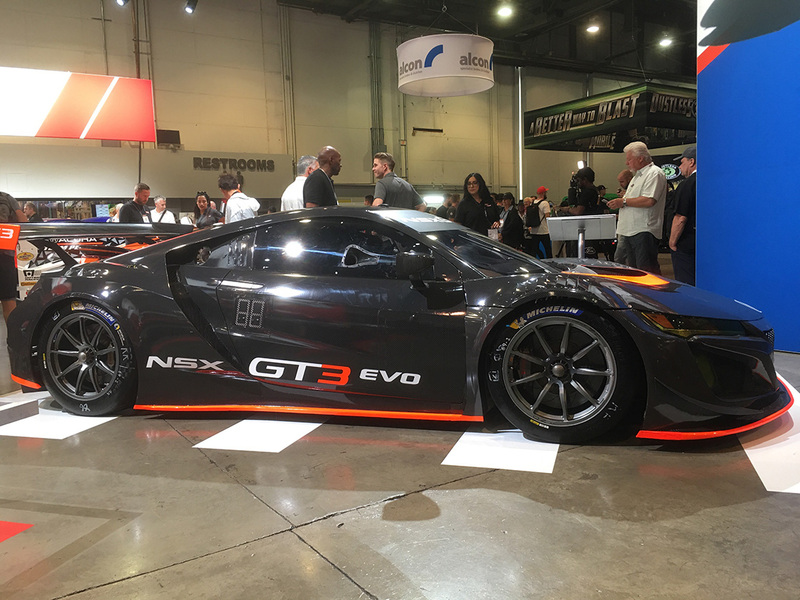 Staying in Las Vegas is always a thrill, but it was just a sideshow to the spectacle of SEMA. 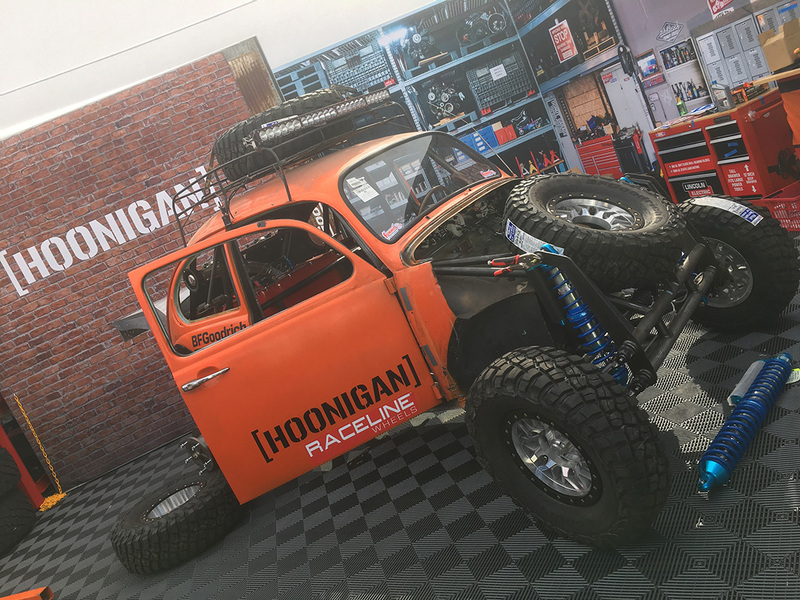 Our first day began with breakfast, then getting set up at the Hoonigan gaming tent for an afternoon livestream. The guest list was deep, starting with Vaughn Gittin Jr., who recently drifted the heck out of out the Nürburgring, the first to ever do so. On the couch with us was Hert from Hoonigan, who recently started up their Twitch channel. Also Danger Dan, who hosts Build Biology, Garage, and other Hoonigan shows, and a special appearance by none other than our friend Tanner Foust. Day Two was an action-packed, shoot-and-scoot set of interviews that took us all over the show. We started with the debut of the new Ford Ranger in a killer Xbox Design Lab Livery. From there we interviewed a SEMA veteran who gave us some insight into the evolution of the show. Next up was a ride-along session with Formula Drift pros Vaughn Gittin Jr. for me and Chelsea DeNofa for Co Pilot (her first ride in a drift car). Then the whole crew hopped in for a wild ride in a Ford Raptor that included jumps and lots of shredded tires. Then, we headed back inside to interview the president of 1552 Wheels in front of Ken Block’s Ford RS200. The Hoonitruck was outside in a prime space and our next stop was to interview none other than Ken Block himself and walk around the Hoonitruck. We ended that segment with Ken and I sitting in the million dollar build that you will see in GYMKHANA 10. We weren’t done yet, Co Pilot and I were about to go for a thrill ride in the Hoonigan Yard courtesy of Big Daddy Braddy and his 800 hp Death Bucket. There was so much smoke, you couldn’t even see and the ride ended with them hitting the wall. ChairSlayer had his hand-controlled S13 ready to roll with me in the passenger seat and, even though he hadn’t driven in 10 months, he didn’t hold back one bit. The scream of the LS motor was deafening. (Note to self: If someone offers you earplugs, take them.) It was donuts galore and smoke filled the yard until we bumped the wall and then crashed the car into the burnout box. Thankfully we were both fine, and the crowd loved it. Leaving the Hoonigans to pick up the pieces, we weren’t done yet, and finished the day by witnessing the crowning of the Hot Wheels Legends Tour winner where Urban Outlaw Magnus Walker among other car lovers were in attendance. All in all there wasn’t a moment wasted making my first SEMA experience one that will be hard to beat. Watch Monday’s edition of “Forza Monthly” to see more from this epic trip to SEMA! We’ve made some upgrades to the Forza streaming studio this week, including new cameras, new lights, and a new streaming PC to boot. While we’re still fine-tuning the setup, I’m excited about the next step in making our weekly Forza streams that much better for you. With that in mind, come check out today’s edition of #ForzaFriday, where we’ll be talking about all the latest news in the world of Forza, playing Forza Horizon 4 and Forza Motorsport 7, and getting ready for our huge November edition of “Forza Monthly.” The fun starts at 3 p.m. Pacific on Twitch and Mixer – see you then!